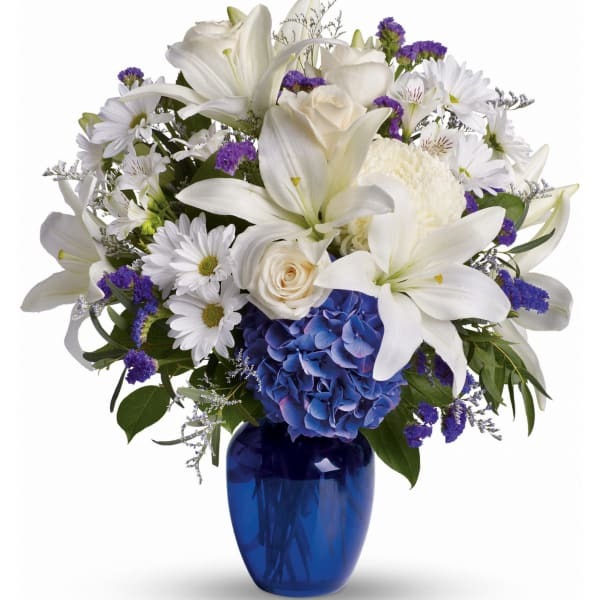 In this arrangement, the serenity of the color blue, along with the purity of intention symbolized by white, will let the family know you are sending your calm strength to them during these difficult times. 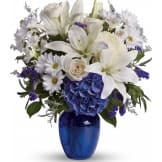 • Beautiful blooms such as blue hydrangea, crème roses, white lilies and alstroemeria along with yellow and white chrysanthemums, eucalyptus, limonium and more are beautifully arranged in a dazzling cobalt blue vase. Flowers will be received by a Grandview Memorial Funeral Home's staff. Flowers were beautiful and fresh. Thank you for being the right choice! The flowers were delivered on time and gorgeous! I would purchase these again. They received many compliments. The family absolutely loved the arrangement we sent. I ordered these flowers reluctantly as I was out of the country when my dear friend passed away. Much to my surprise my friend's family told me that they were absolutely beautiful. In fact they sent me a picture and I agree!! The arrangement was beautiful and arrived early enough for the visitation, I was impressed, and it was so easy. The flowers we're beautiful! They looked exactly like the picture! I was very happy with them! The recipient of this bouquet was pleased with the presentation and quality. Thank you. You helped us express our sympathy from 150 miles away. I wasn't personally at the funeral, but was told it was the most beautiful arrangement there. Delivered on time and was an easy process online. I would use Sympathy Store again and have already referred them to friends. The colors were beautiful - my daughters' mother-in-law siad it was her favorite arrangement. It was beautiful..just like the picture. Flowers exactly as pictured. Ordered at 10 pm and received email confirming they had been delivered at 12:44 next afternoon. Amazing service and so easy. Would definitely use this again. One of the most beautiful arrangements at the service. 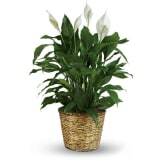 The customer service I received while ordering the arrangement was excellent as well. The hydranga was not deep blue but all else was as pictured. Flowers were perfect and I am pleased. YOU PEOPLE ARE SPOT ON, BY MAKING IT SO SIMPLE TO SHOW ONES REPECT FOR THE DEARLY DEPARTED. We had never heard of the Sympathy Store before and were hesitant about placing an order. When we walked in the funeral home for the wake, we were extremely surprised and very happy that we had placed our order thru them. The "Beautiful in Blue" was everything the picture had said it would be and more. Thank you for a job well done ! Ordering online was convenient and fast. Was informed floral selection looked good and fresh. I would recommend this service to others. I did not see the flowers myself but was told that they were pretty. They did a great by having the bouquet arrive in time for the service. Ordering was very easy. My sister really liked them, I nev er saw them. 1st time using but the whole process was so easy would certainly use it again! I ordered this bouquet because, due to circumstances beyond my control, I was unable to attend the funeral of my godmother. From photos sent to me by relatives and comments I received, the bouquet was "lovely" and "just right". I had no problems ordering this bouquet, no "glitches" in delivery. I'd recommend this service and this bouquet to anyone needing to remember a loved one. I was out of town and needed to send flowers for a funeral service. Got connected with the Sympathy Store and they took care of me. Called me to let me know there was a problem with the delivery then they called the funeral home to reroute the flowers. Thanks so much. 6 months ago another funeral home another town. Ordered online. Arrangement had NO similarity to what I ordered and was unsatisfactory. This order was exactly what I ordered on time, fresh flowers. VERY PLEASED. Thank you. We purchased Beautiful and Blue and were very pleased with the quality, convenience, and service. I did not see my selection displayed at Moore Funeral Home/ funeral of Georgia Kathleen Walker. There were no blue and white flowers as pictured. Was the order not delivered or was a substitution made? I was from out of state from where the funeral was and I really wanted to do something for my manager seeing as how someone close to her passed. This I thought I would have to find a local flower shop online etc. This system made it so easy and thank you! Amazing! This flower arrangement arrived looking just as it does in the picture. It was delivered when promised. The "Live Chat" customer service representative was very helpful and courteous. It wasn't exactly the photo shown online. The vase was a translucent very light blue as were the hygranzas, the roses were red instead of white and there were more carnations that I'd anticipated. I'm noty unhappy, it just wasn't the bouquet I thought I was sending. The picture above was prettier than the actual arrangement. The arrangement sent was very nice though. This service was very helpful in getting the flowers ordered quickly. It was so easy to order these flowers online. I do not live the family so I couldn't go to his funeral and see the flowers and have not heard what they looked like at this time. Thank you for making this process quick and easy. I liked the examples of card notes. The bouquet was gorgeous, but a bit smaller than described. A bigger bouquet was expected from the picture and for the price. Thank you for your help with my flowers. Loved the colour of the blue vase against the white flowers. It was definitely beautiful. Flowers were great , but asked for Dear Friend Bow which was never put on flower arrangement when it arrived . Flowers were delivered timely and found to be in a beautiful arrangement. The selection was easy and service dependable. The flowers got to the funeral service when I needed them to and I was kept informed every step of the way. Superior service and much appreciated! Nice arrangement. A little smaller than expected. First the service rep I spoke with helped me every step of the way . She was very informative and truly cared about assisting and meeting my needs . This was my first time ever at sending flowers this way. I was nervous at first but once I spoke to the specialist I was self assured that everything would work out and it did. 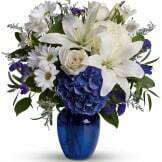 The Beautiful in Blue is what I chose for my friends mothers funeral. I hope that maybe for just a brief moment it helped brighten her day . Thanks again! 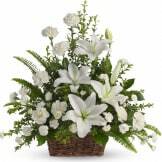 Needed flowers to be sent quickly for an out-of-state funeral - site was very easy to use and the flowers were amazing. Thank you! This arrangement arrived looking exactly as represented online. It was truly beautiful! And it was delivered within a short time of my placing the order. Very nice and tasteful arrangement. Absolutely stunning arrangement. This vendor delivers a quality product in a timely manner. I've used them 3 times and never had an issue. Well I think you guys did a good job on the Flowers, However I ordered a ribbon and it was to have a Blue vase, you called and said you couldn't do the Ribbon or Blue vase. The service was easy to use, the arrangement was delivered on time. We were mislead by the picture online of the size of this particular floral arrangement . Although it was pretty , it was very small in size. This taught me a lesson to in the future pick the arrangement in person,not on a computer . You way over charged and I will warn others about your company in the future . This was just beautiful. The flowers were very fresh and had that just done look about them. The arrangement appeared to be carefully done. I am very greatful for the ease and convince of making a selection at a very trying time. Purchased online , it was quick and easy. Beautiful flowers. looked nice .. just much smaller than i thought would be ..... definately should have upgraded size. I purchased these flowers for my uncle's funeral. The bouquet was nice, it didn't come with the vase like shown in the picture. The process for making my purchase was very easy and enabled me to share a timely demonstration of love and support to a friend who'd lost a loved one. The bouquet that was delivered was just as pictured! Thanks so much! I recently purchased flowers for my aunt who sadly passed away in August, through the Sympathy Store. There was a good selection of floral tributes to choose from. I had difficulties with the online payment as we are in the UK, so I used the On line chat and was given excellent and speedy assistance and was able to complete my transaction perfectly. I would recommend this service and would use them again in the future if the need arises. 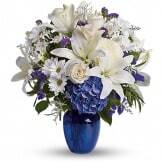 We are very satisfied with the flowers & ease of ordering them. While the vase was beautiful and the flowers sufficient, the delivered product was not as colorful as the pictured arrangement. All of the flowers were white with none of the blue or purple ones included. I'm not sure if this was due to seasonal availability or not. I would have appreciated if someone had let me know prior to the delivery so I could change my order. It was very pretty but only a few of the flowers pictured were in it. The family was very impressed by the flowers which helped alleviate a little of their sorrow. Thank You very much for getting the flowers to the Funeral Home is such short notice. I just heard back from the Family that the flowers were beautiful. Thanks again for the extra effort, very much appreciated. It was a lovely bouquet. The flowers were fresh and arranged beautifully. It was what was presented on the picture. I appreciated that. My friends mom passed away and she responded as soon as she received them and said they brightened her day. Thank you so much for such prompt delivery with short notice. The elegant arrangement was noticed, appreciated by the family, and perfect recognition of a very special person. Delta Flowers of Lansing did an excellent job. The contact representative did an excellent job. Thank you so much for delivering (at short notice) such an exquisite arrangement. It was the perfect remembrance for a very special uncle. They were better than advertised, the vase was actually much prettier than the one in the picture and the flowers themselves were fresh and beatuiful and beautifully arranged. Very tasteful and simply gorgeous. THANK YOU FOR THE GREAT SERVICE! 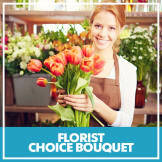 All of our flowers are designed and delivered by hand from a local florist in in Sparta.